New York is treating me so well! I seriously love it here! There is so much to do and see! It reminds me so much of Madrid which I love, because it makes me feel like I'm home! Spending all day in the city running around though, it can get really hot!! Its pretty warm here so I wanted to make sure I dressed comfortable enough so I wouldn't feel hot or whatnot. Well this outfit was perfect for my day of fun! I felt chic and cute but cool enough to not get super hot! I found these shorts from Zara on sale, and I LOVE them! They are so light and cool! They are the perfect shorts for days like these, but also for day at the beach! And I love the colors on the knit top, its just so different and it went perfectly with this shorts. And I loved the little details for this outfit, like the bangles and necklace! The bangles are probably my favorite thing right now, I can't stop wearing them. They are from Ellie's Sparkles, and they are so delicate and pretty. 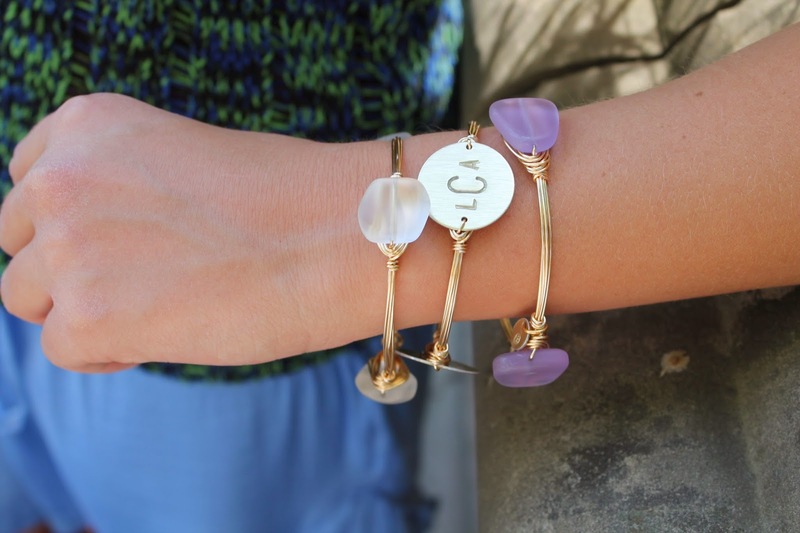 The stones are so pretty, and I love the fact that one of them has my initials on it. And what makes these even cooler is that they are handmade. Loving how the shirt and shorts go so well together! adorable shorts & that necklace is the cutest. glad you're enjoying NYC! Omg those bracelets are so cute. What's your lipstick color?? It looks amazing! Pretty colors and love the jewelry!